Eclipse has a great user interface (UI). But what if I want to do things from the command line, without the GUI? 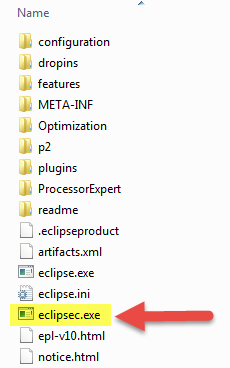 For example to build one or more projects in the workspace without using the Eclipse UI? With this, I can do automated check-outs and do automated builds. will launch Eclipse without splash screen (-nosplash), uses the –application command to load the managed make builder (which is used to build projects), with -data I specify the workspace to be used, and with the -build command it will the project k64f. This entry was posted in Building, Eclipse, Embedded, gcc, Tips & Tricks and tagged arm gcc, Building, Eclipse, software project, technology, Tips&Tricks, tool chains by Erich Styger. Bookmark the permalink. As the -application option suggests, this technique is also called ‘headless build’. It was tested and confirmed working with GNU ARM Eclipse Plug-ins too. thanks for that link (added to the article now), I had missed this one. Yes, the exact same thing works in Kinetis Design Studio too. With the -data you need to specify the *workspace*, not the project. is invalid in its context. The option was ignored.” I think -application org.eclipse.cdt.managedbuilder.core.headlessbuild need be changed! I don’t have that. I have other errors, but I can ignore them, as it builds fine. Maybe this is something you should report to the GNU ARM Eclipse plugins? I follow the step by step to build the project from eclipse command line. But get an error: Program “make” not found in PATH. My KDS version is 3.1.0. 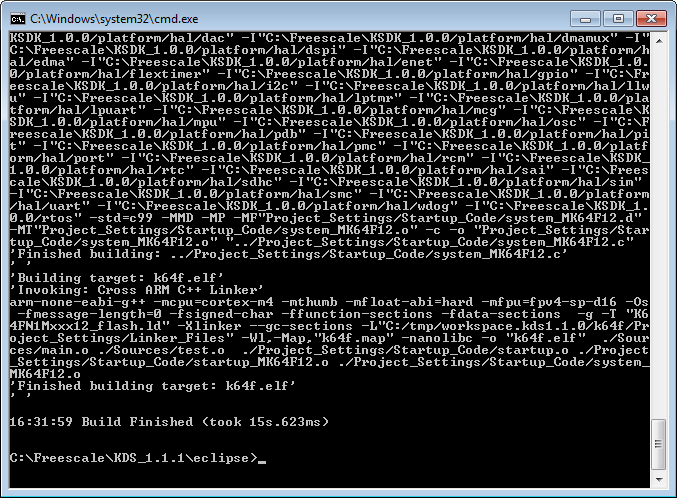 I copy the make file to my path “KDS_3.0.0\eclipse”.and get another error information as below. Did I need to install other SDK package? Copy the make file does not help. You need to make sure that the make executable is in your PATH. And…how to make sure that the make executable in my PATH? I fixed the PATH issue after add these two path for “make.exe” and “arm-none-eabi-gcc.exe”. I fixed the PATH issue. But got build error message as below. I see you not specified a project with the -build argument? You need to specify the project you want to build, e.g. Sorry, I misspelled the command. I am using a project name as argument for build. However for any project I am trying, I get the same error. I’m thinking that’s something I’m not doing right. What I would like to actually achieve is to build from command line the MCUXpresso projects. This is the reason why I have started with KDS, as I thought it would be similar to transition from one to the other. Hmm, I have not tried this with the MCUXpresso IDE, but I would assume it would be the same too? I have managed to find the solution to my error. I had to add the project to the workspace. thanks for sharing! Could it be that commands you have posted are not complete? If your project was not part of the workspace, yes, indeed you have to have it present in the workspace. I was using “” characters to specify project paths or project names. I believe that when I hit Post button, whatever was written between those characters did not get posted. Also the commands are split on multiple lines for readability. One would need to concatenate the command in one line. Many thanks for posting you solution, appreciated!